Ships’ demolition activity still hasn’t picked up during 2019, as ship owners are gauging the market. In its latest weekly report, shipbroker Clarkson Platou Hellas said that “it has been another sluggish week with most end recyclers still closing themselves off having no real appetite to acquire tonnage. This is being particularly felt in both India and Pakistan where any New Year optimism has been completely drained with no positive outlook at all coming from the waterfront. With the slowdown in supply from Owners continuing, due to the profit bearing freight rates, this scenario would normally help price levels to jump, but with so much uncertainty around the domestic steel rates and the rumor of China dumping cheap steel billets after Chinese New Year, many are predicting a correction is possible in a negative manner which could potentially pull indications closer to the USD 400/ldt mark. The only plus side, should a downwards correction become evident, is that the industry stakeholders would finally have a clearer picture and may force some Buyers back into the market atmosphere with the knowledge that they can once again purchase tonnage, provided of course, Owners accept that there would be a new market position and start build some momentum finally in this year. The only destination giving Cash Buyers any traction is Bangladesh which has offered impressively for the container units that have surfaced into the market place which is aiding speculative offers by some cash buyers, however here to, sources suggest that a shortage of U.S. Dollars and the large volume of arrivals to the Chittagong yards recently may stem any further positivity”, the shpibroker said. In a separate report, Allied Shipbroking said that “with freight earnings being at relatively satisfactory level for most owners and with market sentiment still holding at overall good levels despite the recent decline noted on several routes and trading regions, appetite for demolition remains low. Therefore, it is of little surprise that we witnessed sluggish activity levels for yet another week. There was limited activity being noted on tankers untis, while no activity was to be seen in terms of dry bulk vessels. The most interesting deal reported last week was the sale of a 20-year-old Aframax. The lack of scrapping candidates could potentially trigger a boost in offered prices amongst most major cash buyers. However, this has not yet materialized due to poor fundamentals prevailing in the Indian Sub-Continent markets, such as low steel prices and weak local currencies. Bangladesh seems to be the only scrapping destination who’s outlook is still positive, as it remains the most competitive market player right now. On the other hand, Pakistani and Indian breakers have seen their activity slumping over the past few weeks, with prices at levels that are unable to entice fresh tonnage. In Turkey, fundamentals seem to be improving, with local steel price and the Turkish Lira posting some gains, but with little evidence of this improvement as of yet in terms of market activity”. Meanwhile, GMS, the world’s leading cash buyer, said in its latest weekly report that “it has been another shaky week in the subcontinent markets, with prices and sentiments across the board, seemingly declining by the day. Cash Buyer focus of late has been on the resale of a multitude of their unsold (and expensive) inventory basis a Bangladeshi delivery in mind, a destination which is swiftly starting to fill up. 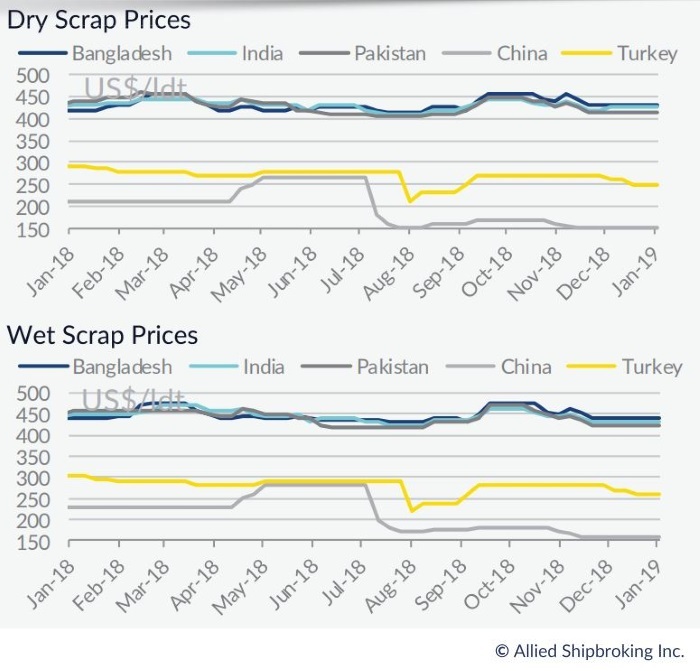 Challenges in securing local Buyers with appropriate L/C limits also continue across the Indian subcontinent, as banking hurdles become one of the chief concerns for ship Recyclers and Cash Buyers alike. Meanwhile, despite a growing demand, the Pakistani market has failed to secure tonnage for yet another week and local offerings are currently positioned so far from reality, that many in the industry are fearing not only a quiet January, but perhaps a worryingly quiet first quarter in Gadani”. It added that “India endured another troubling week with declining local steel plate prices and a Rupee that is now mimicking the volatile personality of local steel plates. As a result, very few firm (and meaningful) offers from Alang Buyers were forthcoming as talks of further possible declines on the horizon started to make the rounds. The volatile fundamentals are now raising concerns that local offerings may even dip below the USD 400/Ton mark, especially if the current trend persists. Finally, the Turkish market registered a minor improvement in local steel plate prices; however, the Lira also registered a noteworthy improvement this week, which in turn is being attributed to the firming steel prices. On the supply side of things, containers continue to be the flavor of the moment, with a number of Panamax and mid-range units on offer and even more slated to come for sale in the weeks / months ahead. 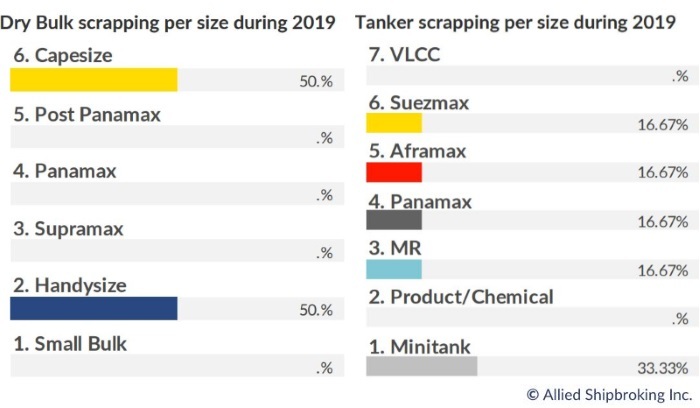 On the other hand, amidst an uptick in charter rates, the volume of Tanker recycling has slowed considerably of late. As such, the most active sectors at present continue to be offshore and containers, in what is sure to be another busy year for ship recycling markets”, GMS concluded.